Mayfield's Martial Arts Academy cordially invites you to attend Sergeant Major Mayfield's 5th Open Judo Championships, here in Jacksonville, North Carolina, this coming February 27, 2010. 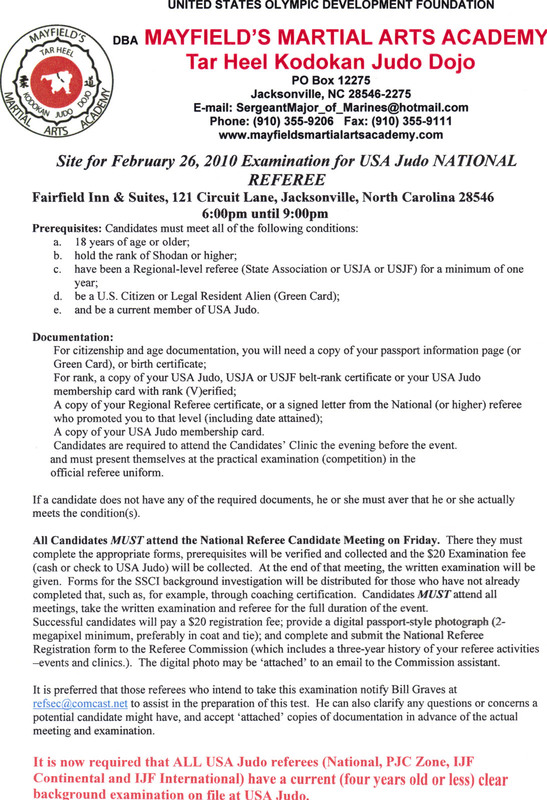 We will also host a USA Judo National Referee's Examination on February 26, 2010 at the Fairfield Inn & Suites located at 121 Circuit Lane, Jacksonville, North Carolina 28546. For room reservations you may call 800-228-2800, but get it done early because the deadline to ask for the "Judo Rates" is February 12, 2010. We also ask that you share this information with your friends, colleagues, students, family, and other judoka, so that referee candidates may take advantage of an examination that is located in the "Down East Region", for the first time, and judoka can have a good tune-up competition prior to the 2010 USA Judo Scholastics in Spokane, WA on March 12 & 13, 2010 and the USA Judo Senior Nationals in Myrtle Beach, SC on May 1 & 2, 2010. Referee candidates are strongly encouraged to immediately apply for your Background Screening and to make direct courtesy contact with the Referee Commission Assistant, Mr. Bill Graves, at refsec@comcast.net, to ensure that they come totally prepared. All coaches, parents and competitors are encouraged to ensure that all competitors wear IJF Regulation Judo gi' and that they bring their own properly fitted white and blue belts. We will enforce the uniform regulation more strictly, so please do not cause your student, child(ren) or yourself to lose a match for noncompliance with the rules. Also note that absolutely no mixed uniforms (blue and white) will be permitted and there will be no matches allowed where both competitors are dressed in blue judogi'. For your convenience, the Sokuteki (gi measuring device) will be available at each table.